Every rider has the heard the saying “no hoof, no horse,” but not every rider knows the four key factors that can impact their horse’s hoof health. 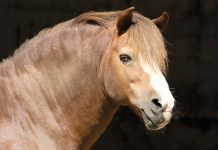 Visit SmartPak.com/HoofHealth to find out what they are and learn how to help your horse build a solid foundation. 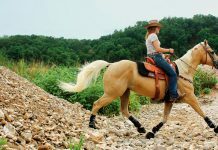 Keeping your horse hooves healthy isn’t as easy as painting on dressing every day. Unfortunately, traditional hoof dressings can lead to dry and brittle or soft and weak hooves. From professional maintenance to nutrition and exercise, here are some of the most important things horse owners should know to help ensure healthy hooves. From the dewy morning grass to the dusty sand ring, environmental shifts can take a toll on his hoof health. Frequent, dramatic moisture shifts cause the hooves to rapidly expand and contract, which can lead to cracks, fissures, and other problems. Follow Sawyer throughout his day and you might be surprised how many times his hooves go from wet to dry! Question of the Week: What is thrush?